Calling card of Alton G. Cummings of Detroit, Maine. He was Alton Gustavus Cummings (1857-1932). 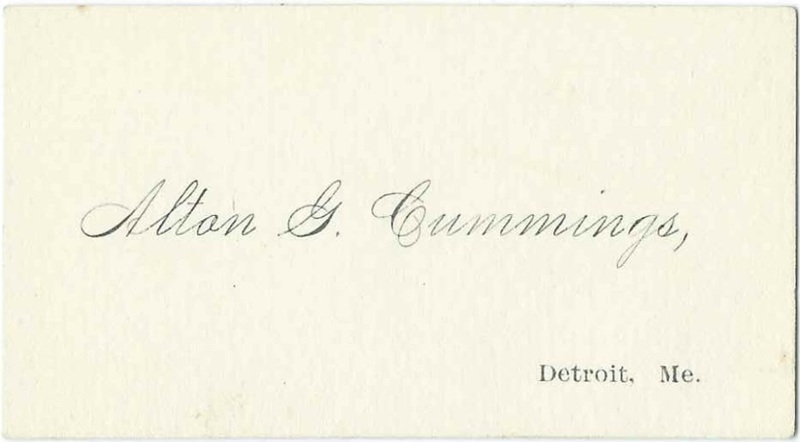 The calling card probably dates to the years around 1880 when Alton is shown on a census of Detroit, Maine, living in the household of his married sister, Emmeline Flora (Cummings) Harding, wife of Gideon Harding, Jr. Alton was working as a farmer. Alton Gustavus Cummings was born about 1857 at Sidney, Maine, the son of Gustavus Cummings and Mary Ann (Spaulding) Cummings. By 1900 and perhaps years earlier, he was living at Boston, Massachusetts, where he gave his occupation as counter man at a lunch room. When Alton was fifty, a bachelor and working as a "show-man" at Boston, Massachusetts, he married 17 year old Gladys Viola Haskell, also born at Sidney, Maine, the daughter of Perley Haskell and Ida G. (Smith) Haskell. What Alton meant by "show-man", I don't know, but I wonder if he worked for Benjamin Franklin Keith, a vaudeville impressario at Boston, Massachusetts, or one of Keith's counterparts. Alton and Gladys farmed on Middle Road at Sidney, Maine, and had several children. Alton died in 1932 and Gladys in 1985; they're buried in the Reynolds Cemetery at Sidney, Maine.